Rows 3 & 4: Work sc in each sc across, chain 1, turn. Rows 6 & 7: Work sc in each sc across, chain 1, turn. Rows 9 - 15: Work sc in each sc across, chain 1, turn. Row 20: Work sc in each sc across, chain 1, turn. Rows 22 - 27: Work sc in each sc across, chain 1, turn. Row 29: Work sc in each sc across, chain 1, turn. Sew the 2 bunny sections together, stuff but not too firmly before closing. Row 2: Work sc in each sc across, join, ch 1, turn. Rows 4 & 5: Work sc in each sc across, ch 1, turn. Rows 7 - 10: Work sc in each sc across, ch 1, turn. Rows 12 -14: Work sc in each sc across, ch 1, turn. Row 16: Work sc in each sc across, ch 1, turn. Row 19: Work sc in each sc across, ch 1, turn. Row 22: Work sc in each sc across,ch 1, turn. Row 24: Work a dec sc over next 2 sc, fasten off. Holding pink section over white section, using white yarn and working through both thicknesses join yarn and work sc evenly around entire outer edge of ear, having 3 sc in each end chain of foundation chain and 3 sc in the sc of row 24, join in first sc, fasten off. Sew ears to top of head, they can be put in any position you desire. Rnd 5: Work sc in each sc around, join in first sc, fasten off. Sew the 2 muzzle pieces together by sewing together at rnd 5 over 4 sts only. Border: Rejoin yarn in any sc of rnd 5, chain 1, work sc evenly around rnd 5 of muzzle, join in first sc, fasten off. Sew muzzle to center of head over rows 19 - 26. Stuff lightly before closing. Row 3: Work sc in each sc across, chain 1, turn. Row 6: Sc in each sc across, fasten off. Sew nose over muzzle with the bottom end of nose in line with center of connected muzzle sections. With pink, chain 16, sc in 2nd chain from hook and next 2 chains.Leave remaining chains unworked and chain 12, leaving a length of yarn for sewing, fasten off.Sew mouth to pillow with the sl st stitches coming down from nose and form a smile with the two chain sections. Rows 3 - 5: Sc in each sc across, chain 1, turn. Row 6: Sc in each sc across, do not chain 1, do not turn. Border: Work sc evenly around outer edge of eye, join in first sc of border, fasten off. Eye edging: You can do this with any color...I used purple because it was what I had on hand. Join yarn in front loop only of eye border and sl st around outer edge of border. With black, chain 2 and work 4 sc in 2nd chain from hook, sl st in same ch, leaving a length of yarn for sewing, fasten off. Sew pupils to bottom of eyes. 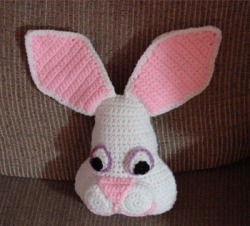 Sew eyes to bunny center evenly over muzzle.